I have to admit, when I first came across this item, I thought it a little odd. But once it became available in glossy red, I was swayed by its prettiness and decided to give it a try. And, then, it was love! Today's favorite thing is my "I'm Not a Paper Cup" cup. The original white ones look identical to a logo-less, big coffee chain, throw away mug. These cups, however are re-usable. 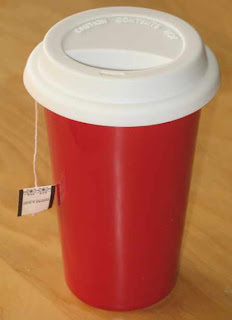 They are a double walled porcelain cups with a silicone lid. The double wall has a hollow space between which provides insulation. The silicone top keeps the heat from escaping out the top. This means that your hot drink stays hotter for much longer. Ingenious! And pretty. I always thought they were odd as well. If only they came in lime green... Are they meant to be used as travel mugs? Porcelain doesn't seem to be a wise choice of materials if it is. I wouldn't use it as a travel mug. I would worry about breaking it. I found a shop in Toronto that sells these and thinking about purchasing one. It would be a great and earth friendly way to keep my coffee warm a little longer on my desk at work.